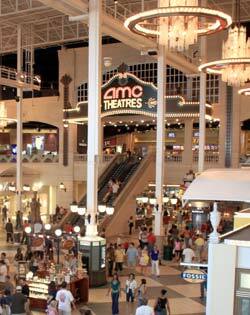 Easton opened in 1999, and has become a popular shopping, dining and entertainment mecca. Easton is really a city within a city. A neighborhood of shops, restaurants, theaters and townhouses. Friday and Saturday nights the center is seeing an increasing number of teens who find the town center to be an ideal gathering place. The brick lined streets are more friendly to pedestrians that autos, but that's the best way to visit Easton— on foot, whether its just window shopping, looking for that unique gift, an afternoon at the theater, or finding a unique dining opportunity. The main covered mall, really isn't like other malls. It's designed to resemble a large train station with mulitple levels of shops and food. Going outside the mall, you'll find a small village of shops, fountains, and upper scale restaurants. The main anchors are Macy's, Nordstrom, Crate & Barrel, Smith & Hawken, and Willams-Sonoma. There is plenty of parking surrounding Easton Town Center.